Ghosts, goblins, and a surprise marriage proposal. Oh, my! 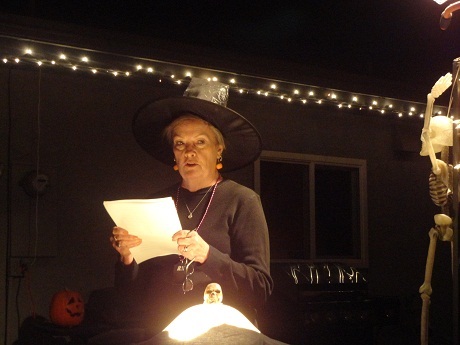 Last night, writers from three Inland Empire critique groups were greeted at the second annual “Ghostly Gathering of Writers” by our gracious ghost hostess and author, Marissa Perez and her family. 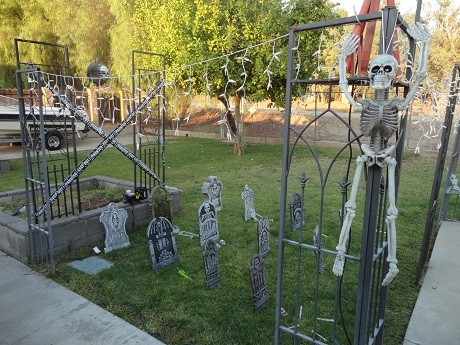 As we arrived, everyone oohed and awed over the creepy décor and fun and spooky treats. There were sticky cobwebs draped everywhere. And lots of creepy eyeballs, skeletons, and spiders! EEK! 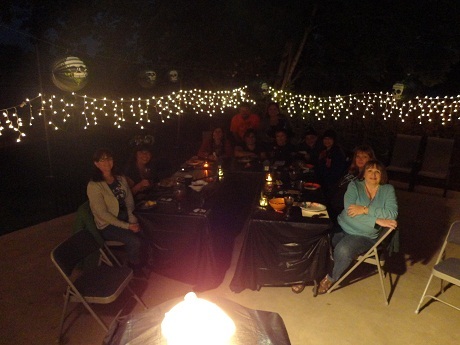 After we filled our plates, we gathered on the patio where paper lanterns with skulls swayed in the cool fall breezes from a mock graveyard with headstones guarded by skeletons. We’re writers, so naturally our imaginations zipped into overdrive. Soon barking neighborhood dogs became a pack of hungry coyotes and howling werewolves. With the eerie mood set, we quickly got into the spirit of the evening and the storytelling began. 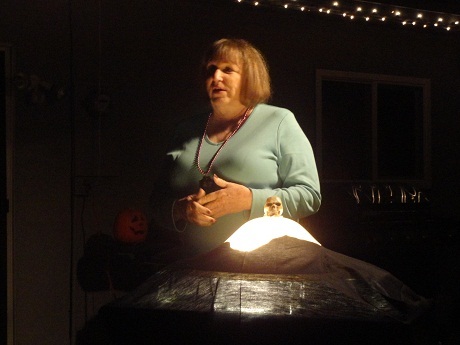 One-by-one, guests stood at a large, glowing orb and shared their haunting tales. 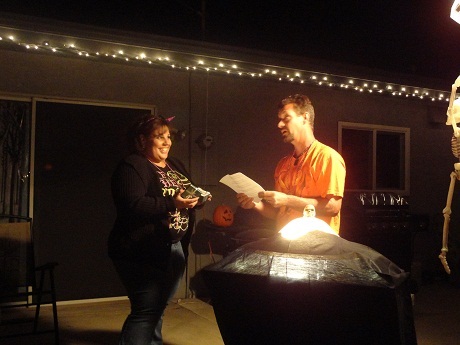 After a dozen stories, Marissa’s boyfriend, Brian, stood at the bright orb and read his version of T’was the Night Before Christmas with a quirky Halloween twist. Midway, he became serious, his voice began to crack, and his hands started to tremble. 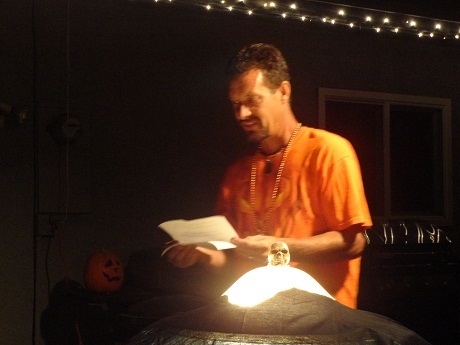 Brian’s a non-writer so I understood his uneasiness to read before a group of writers. But as he continued to read, he pulled out a small gift box and asked Marissa to join him at the glowing orb. A puzzled look crossed Marissa’s face. Then a smile. At this point, we all glanced at one another and fumbled for our cameras. Just in time, too, because Brian dropped to one knee and proposed marriage. Marissa said yes. And we all leapt from our chairs to congratulate the newly engaged couple! It all happened so fast. None of us caught the proposal on video. 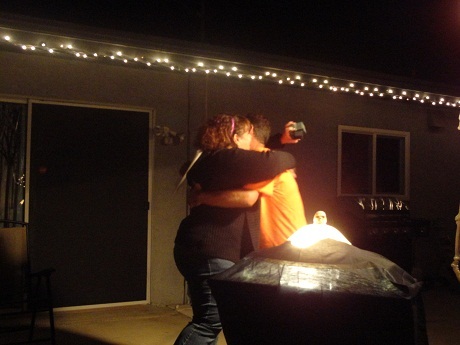 But I did capture the endearing moment with a few photos along with pictures of the ghost story party. Do you have a surprise marriage proposal story or ghostly tale to share? This entry was posted in Uncategorized on October 14, 2012 by mariacisnerostoth. Oh my goodness! How fabulous!! 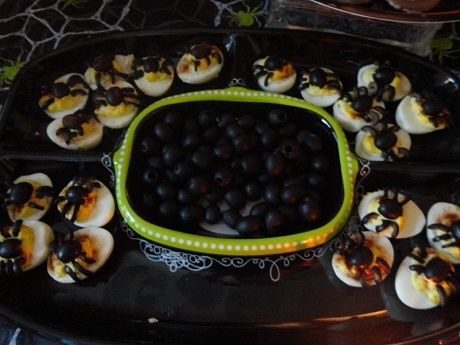 Both the Halloween party worthy of Martha Stewart and the sweet proposal! I don’t have any interesting stories about Halloween. I used to make interesting costumes for the kids when they were little, but I have no time to sew anymore..and they’re too old for dressing up anyway. My hubby proposed to me while we were canoeing in Florida early one morning with manatees swimming below us and mist rising from the water. It was rather magical, now that I look back on it. 😉 But, it’s not the most interesting proposal really. Teresa, I think your marriage proposal is awesome! It does sound magical, and beautiful, too! Aww, thanks, Lynn! Manatees are pretty amazing creatures to have around for witnesses. LOL! On the contrary, Teresa, I love your marriage proposal! And a proposal while canoeing ranks pretty high on the romatic meter! With the rising mist and the manatees. Yep. I’d say it was magical! Bravo, Maria! This is great! You summed the night up perfectly. After all the scary stories (and me literally trembling with fear in my boots), it was a happy ending with Marissa and Brian getting engaged. What a wonderful surprise! So I got to leave on a happy note. I’m afraid to hear the other story, especially if it’s true, but I’ll come back later when I’m feeling braver and will watch it. Today I pay for not taking it easy on my sore back yesterday, but it was worth it. I’m so glad I didn’t miss this! 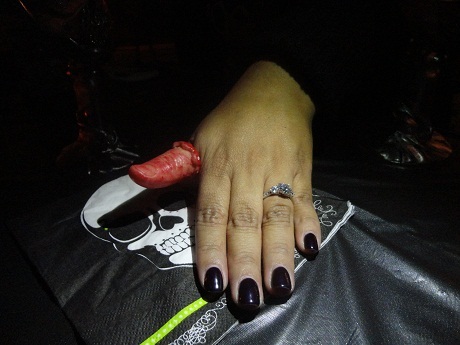 That picture of Marissa’s ring and the gory thumb is a riot! Lynn~I had a blast, too. And glad I got to sit next to ya ’cause you totally get my sometimes weird, quirty humor. After everyone left, Carol patiently waited while I lured Marissa back to the Storytelling Orb and she told her story. She didn’t skip a beat while retelling her creepy Doppleganger tale. And yes, it really happened! So glad I captured her telling it on video. Listen to it sometime when you’re rested up and on a bright sunny day…and with George at your side, so you can hang on to his arm. LOL! And the engagement was the highlight of the night! So romantic!!! 6 a.m! Maria, I don’t know how you do it. Can you pass me some of that jungle juice you must have in your veins because my eyeballs are on the floor after my measly midnight bedtimes!! You two are so lucky you get to hang out together! Hope your back is feeling better now, Lynn! And the marriage proposal was a nice unexpected twist to the gruesome tale!! 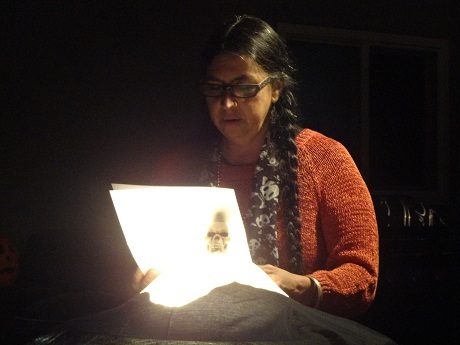 Yvette~Maybe someday the WANA tribe will have their own ghost story party! It’s so much fun. The idea came about 14 years ago. I attended an author’s book lecture at an Indie store on this quaint, old-fashioned street in the City of Redlands. 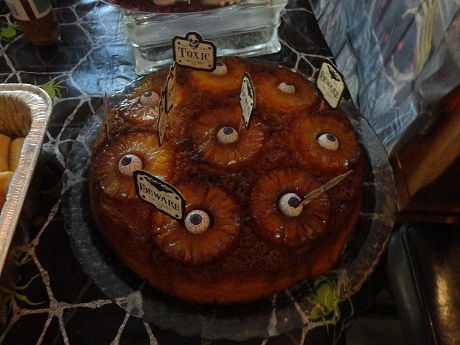 (munching on leftover eyeball cake while I’m writing this) Anyhow, these college chums would gather every October for more than 10 years and they read their original ghostly tales at ghost story parties. Eventually, they decided to publish some of their best stories in a book titled “Harvest Tales & Midnight Revels,” featuring 19 stories. 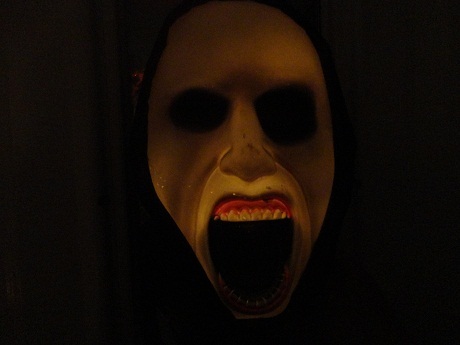 That night I knew I had to host a ghost story party, so Joey and I hosted them for two years in a row. Marissa ‘loves’ ghost stories and enjoyed the party. (That’s when I first heard her tell her ‘Cindy Saver’ story.) 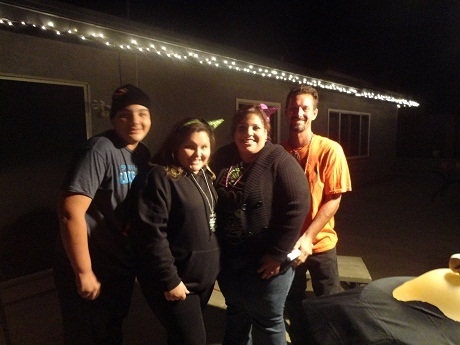 Last year she and her awesome kids hosted their first party. It was great fun! 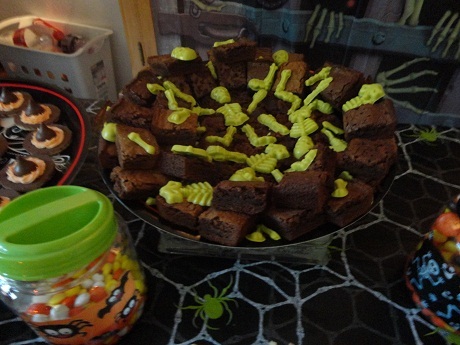 And this year the spooky level was cranked up a notch (LOVED the storytelling orb! 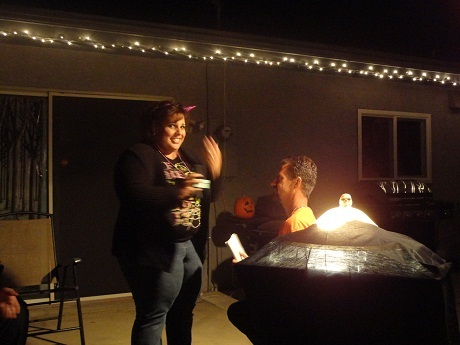 ), and the surprise marriage proposal made the evening so special for everyone there! Wow!!!! Terrific reply, Maria. I love the sound of the Mission Inn, and the Author’s Floor 🙂 How cool that you guys got to work on a book that way, together. Fun times! 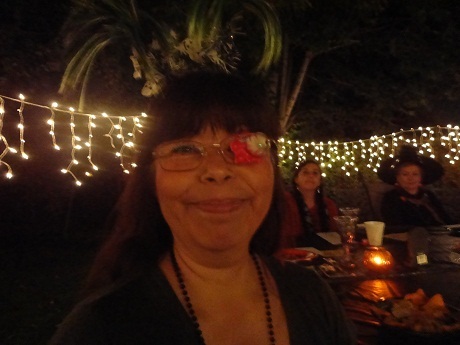 Yvette~did you get the FB msgs & emails. HV in the U.S. is still opened for submissions till this around this time tomorrow on the 15th. Yay! And trust me… I’m paying for staying up till 6 a.m. But I was determined to get this blog post up. LOL! Wow, I just came online while my carer supporter, Colleen, is giving the boys a bath. No, I didn’t know they were still open! Will go and check…. I agree, Yvette! It’s so great to see Maria blogging! This was the best party! I’ve never seen a proposal in person before (other than my own, of course), so it was so exciting and romantic to see how Brian went to so much work to make this a special day for Marissa. Hi Carol, yes, it was a GREAT party! Also, aside from my own, it was the first marriage proposal I witnessed, too. Wow! It really was romantic. They make a cute couple! Looking forward to the wedding!